I’ve been very impressed by most of the Transformer toys produced by third party companies in the past couple of years. I’ve been collecting third party renditions of many of the small and mid-sized characters. My toy of the year for 2012 was iGears’ version of the insecticon Bombshell, whom they called Stormbomb, and last year iGears’ version of Gears (Cogz) took my number two spot. I wish I could collect more of them, especially the larger figures such as the combiners and dinobots but they’re just too damn expensive. On average the larger third party figures cost somewhere between $100 and $200. Even the smaller guys that I purchase are priced pretty steeply between $40 and $60. It makes for a very expensive hobby. It’s not at all uncommon in toy collecting to buy a figure only to have a new and improved version come out a few months, or maybe years, later. This is why I have over 20 Snake Eyes figures. It can be annoying but it comes with the territory and it’s really not that big a deal when you’re talking about $10 G.I. Joe figures. What really frustrates me is shelling out big bucks for one of these third party figures only to have another third party company produce something better right afterwards. This seems to happen more often than not these days as if the companies are directly competing with one another. It’s the main reason why I haven’t splurged on any larger third party figures. There are often multiple versions of a character out there and I want to wait and make sure I get the very best one. Even the iGear versions of Gears and Swerve that I loved so much have potentially been topped by new versions from MakeToys. I don’t have them in hand yet to compare but they’re in the mail now. One of my childhood Transformers that I most regret getting rid of is my Sharkticon. It’s actually kind of a weird character for me to have taken such a liking to. 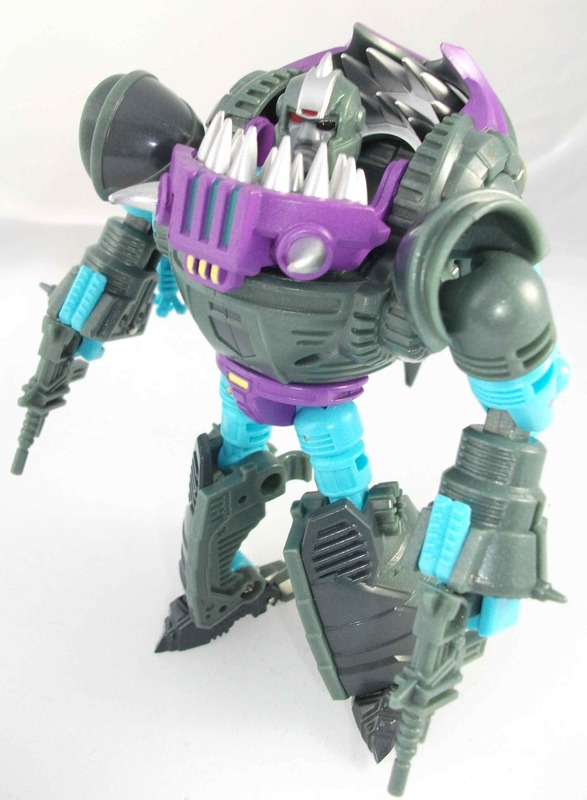 The Sharkticons were introduced in the 1986 animated Transformers movies alongside characters like Kup, Wheelie, Cyclonus, and Unicron. As I stated in my reviews of those figures, the movie kind of rubbed me the wrong way at the time. All of the characters we knew and loved (Optimus Prime, Megatron, etc.) were killed off and replaced with new characters. I didn’t care for the sci-fi look of the new characters and I was a little bitter about how many of my favorites characters were wiped out so unceremoniously. I hardly collected any Transformers figures based on the movie and the later seasons of the cartoon. The only figure I owned of a character introduced in the movie was the Sharkticon. 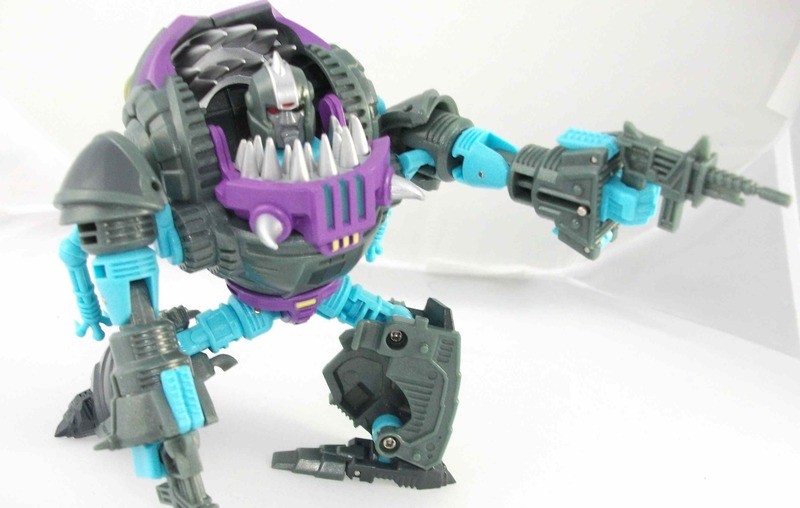 The Sharkticons were dumb brutes who didn’t speak. Newly introduced baddies, the Quintessons, would feed prisoners to the Sharkticons if found guilty of their crimes. 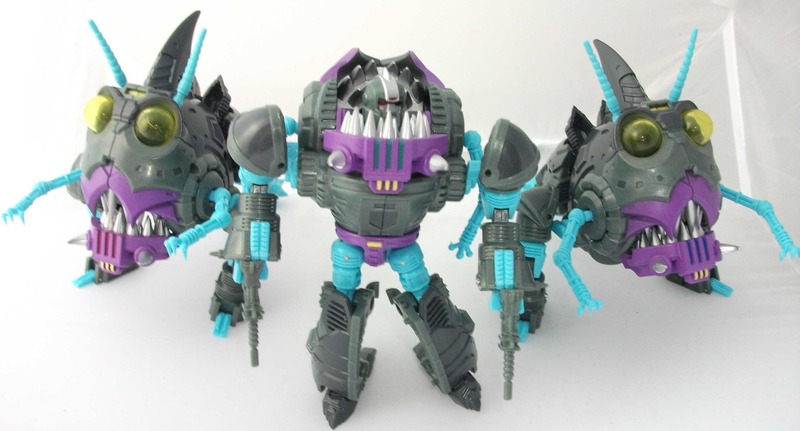 The Sharkticons didn’t really look like sharks, seeing as they were round and had arms and legs, but I guess they got their name based on their giant mouths full of multiple rows of teeth. In their “shark” mode I thought they made for a cool looking monster, and I love me a good monster. This is why the Sharkticon was one of the last, if not the last, Transformer toy I purchased before walking away from the brand. 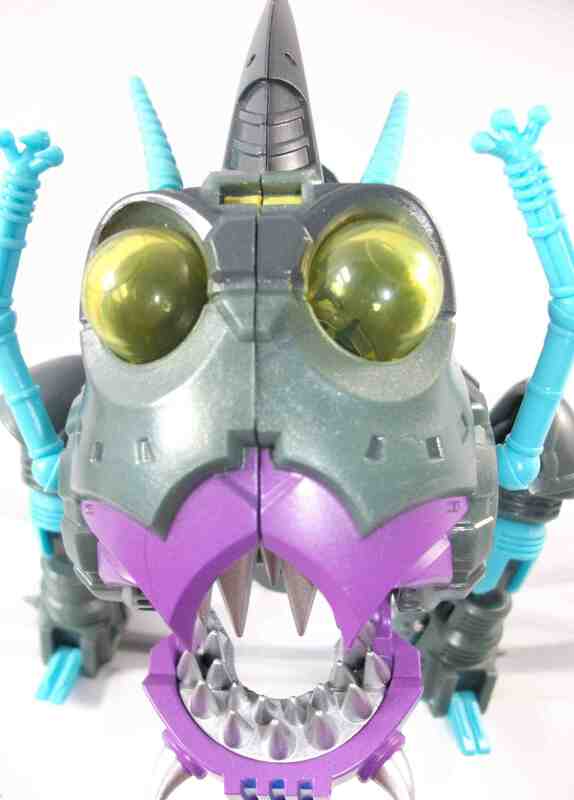 Now I liked the original Sharkticon toy but it suffered from the same issue that many old Transformers toys did, in that it failed to capture the look of the character from the cartoon. Sharkticon translated better than most but the original toy was short and fat, and almost cute in his robot mode. The Shark mode was much better which is why I kept mine in Shark mode 90% of the time. It’s been nearly 30 years since Hasbro released that original Sharkticon and it’s about damn time somebody updated the thing. 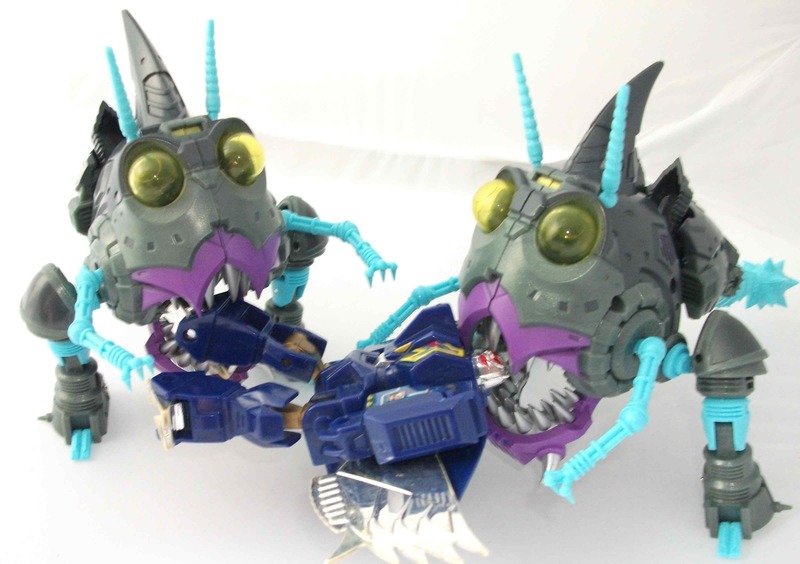 Within weeks of one another, both iGear and MakeToys announced they’d be releasing a 3 pack of Sharkticons in 2014. Had they been selling them as singles I probably would’ve pre-ordered one from each company but since 3 packs were my only option (which upped the price considerably) I had to choose one or the other. I went with iGear based on their track record. Well, my iGear Sharticons, called the Shark Attack Squad, showed up in the mail the other day. I was quite surprised at how large the box was. There was really no need for that much packaging since the figures themselves aren’t very big but there was some nice original art on the box. On the back were bios of the 3 characters whom iGear has named Quint, Hooper, and Brody,as a little wink to the movie JAWS. 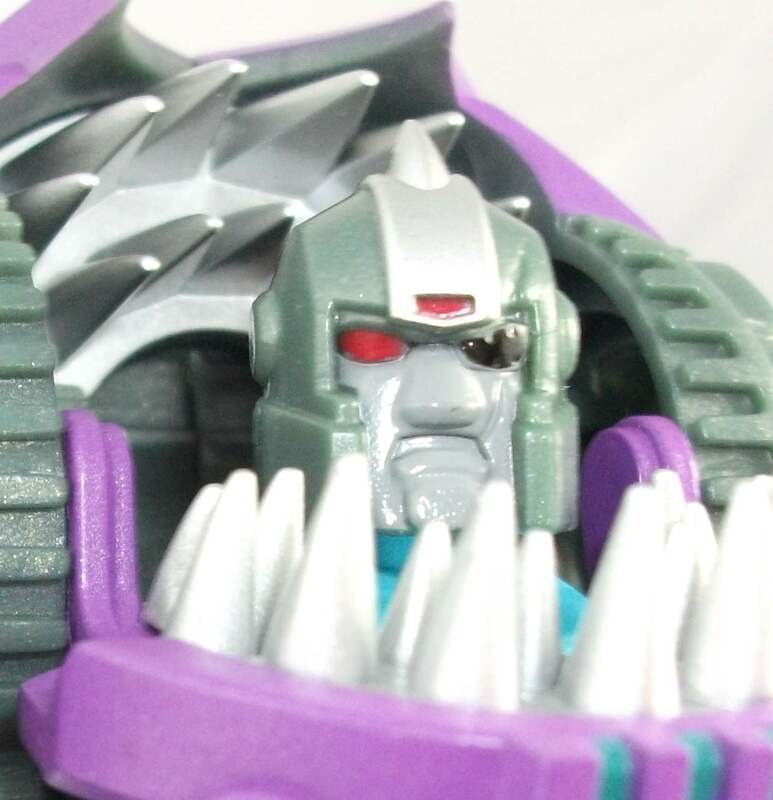 The three toys are nearly identical except they have slightly different face sculpts when in robot mode (one is scowling, one is smiling, and one is missing an eye) and they each have three bars on their chest which are painted different colors. 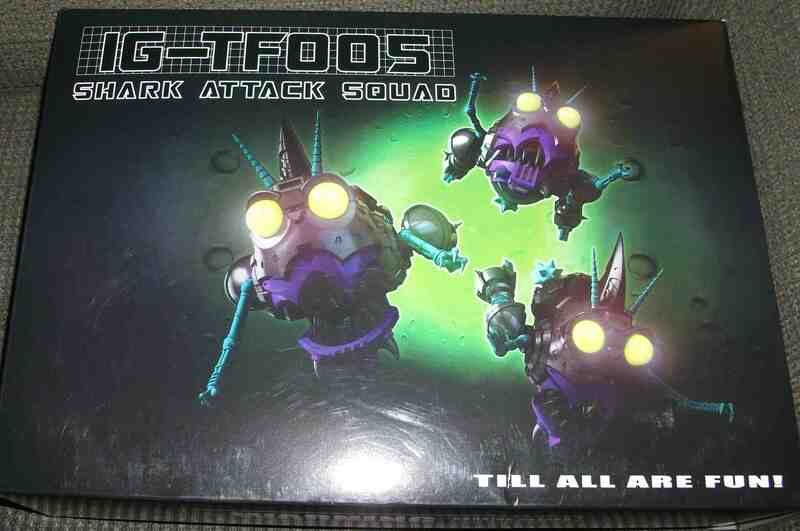 Each figure came with a pistol, a rifle, and a mace which serves as his tail when in shark mode. I was a little skeptical about the quality at first as the first one I took out of the box felt a little loose and his shoulder pad immediately popped off but after fiddling around with them I’m confident in the quality of these toys. The shoulder pads are flimsy on all of them but thats my only real complaint. The colors look great. They’re very screen accurate and iGear has done away with the pink of the original toy. The multiple rows of teeth are painted a nice metallic grey though I do miss the vac metal look of the original. 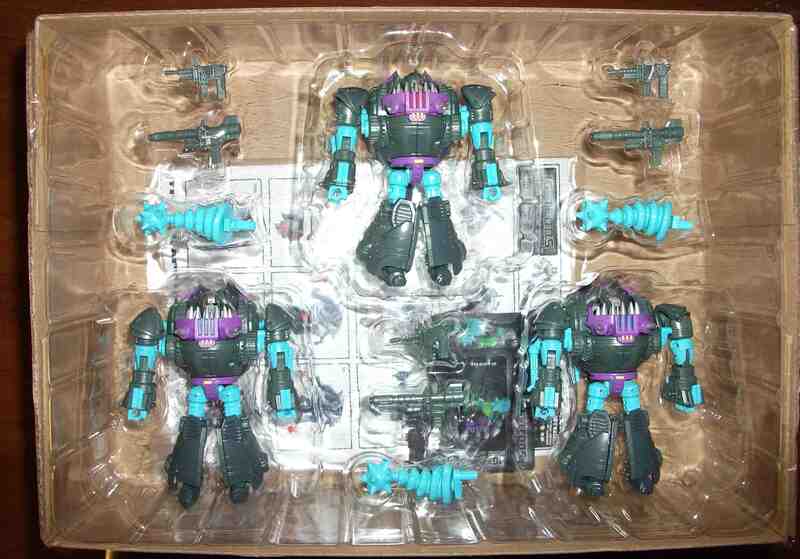 These Sharkticons aren’t nearly as round as the original toy. The robots look bulky but not fat. Their faces are obscured by the teeth a little more than I’d like them to be but it’s not a major issue. There’s a full range of motion and they can be displayed in multiple poses. The shark modes look amazing. I love the big translucent yellow eyes. These guys look creepy. Their arms, legs, and antennae are all ball jointed and the jaw can be opened nice and wide. This is another big success for iGear. The price was even quite reasonable considering that 3 figures were included. 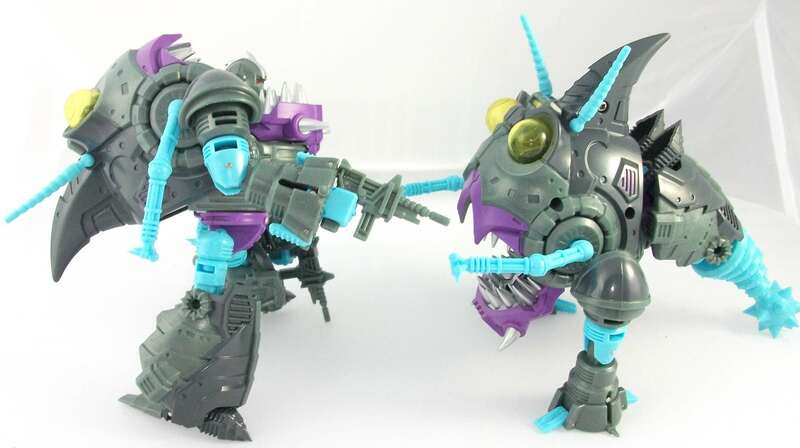 I may pick up a single MakeToys Sharkticon on ebay one day if the price is right but I’ll be content if these are the last Sharkticons I ever buy. 9 out of 10. Posted on April 28, 2014, in Transformers and tagged Action Figure, Review, Toy, Transformers. Bookmark the permalink. 11 Comments. Neat figures. I love the wink to JAWS. I didn’t remember this character till I scrolled down to the image of the vintage figure. I’d like to get one of these just to have on my shelf. Just a s a neat monster robot. I always mean to ask. Since you’re a box opener like I am. Do you keep the packaging or toss it out after? I toss everything unless it’s a really cool box. And even then I usually trash em because I don’t have the space to store empty boxes and cards. I keep all my Joe blister cards. I also keep the boxes for my “high-end” 12″ figures. That’s about it. Just got these guys two weeks ago! Have you seen the leader figure coming? My only real complaint with these figures is the sharp points. Especially on the claws and feet. Definitely not for kids to play with. Good “point” about the sharpness. Mine are strictly for me so it’s not an issue but could definitely be an issue for kids. I did see the leader. I hadn’t planned on getting him but i’m quite impressed with these figures so I’m considering it. You gonna get him? Good pun on the “point”! I would like to get the leader figure, but I’m pretty satisfied with these three. I don’t remember there being any different looking “leader” characters in the movie so I think I’ll save my money. In the Dreamwave Transformers comics Wheelie had a pet/friend Sharkticon named Gnaw. If I got the leader I would display him with my Autobots as Gnaw. If I did that, I would have to be sure to get that new 3rd party Wheelie that’s coming out! I do have Generations Wheelie, which is still pretty nice. The new 3rd party one does look really nice but I’m content with the Generations one. I never really cared for the character anyway. Nor did I…I am at core a fan of the original Marvel G1 comic and he never appeared in that. I have an Encore Wheelie as well, and it’s neat. He was still nearby from when i reviewed him so i fed him to the sharks.